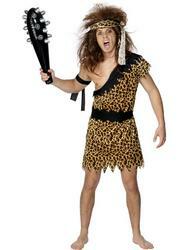 Unleash your wild side with this amazing Cavewoman fancy dress costume. The pretty prehistoric outfit comprises of a stylish dress decorated with a fabulous leopard print, a black belt, a pair of white leg jambs styled with wrap around ribbon detailing and completing the costume is a matching headband. Perfect for any Cave person or historical themed party, this costume makes for a stylish alternative to the Wilma Flinstone fancy dress costume.